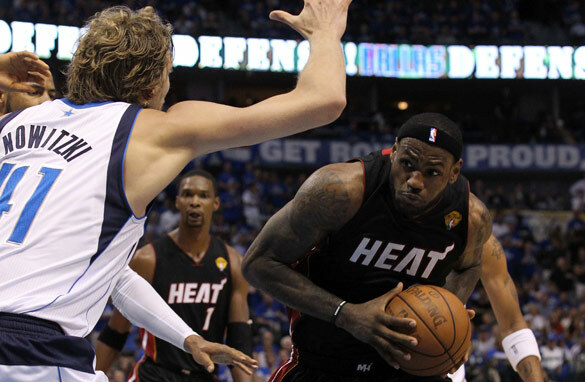 LeBron James of the Miami Heat drives in vain against the Dallas Mavericks' Dirk Nowitzki. Dirk Nowitzki can’t catch a break. After taking the bulk of the blame for the Mavericks’ Finals loss to the Heat in 2006, the big German produced a brilliant performance as Dallas won their first NBA championship in 2011. Nowitzki won the Finals "Most Valuable Player" award despite battling injury problems and illness midway through the series. But despite such efforts much of the U.S. media outside of Dallas, decided the biggest story remained LeBron James’ latest failure on the big stage. Remember, James left Cleveland for Miami in the off-season to join forces with Dwyane Wade and Chris Bosh for what they hoped would be a championship-winning combination. It may be in the future, but not now. “King” James was easily the Heat’s best player during the regular season and continued his great play throughout the Eastern Conference playoffs. Often labeled as a man who disappears during big moments, James shined as the Heat rolled over the Boston Celtics in the second round. Scottie went a bit far with that statement to put it mildly. Maybe he needs to take another look at the half dozen championship rings he won thanks to his former teammate Michael Jordan. But even the harshest James critics were running out of ammunition after he led the Heat to the Finals in only his first year in South Beach. The stage was set for “The King” to finally be crowned under the bright lights. All he had to do was continue his blistering form. And he did, at least for a game and three quarters. After the Heat won the opener, they built a 15 point fourth-quarter lead and were looking to be on their way to a commanding 2-0 series advantage. The Mavericks closed the game on a mammoth run to even the series at 1-1. James was never the same after that. The killer instinct he displayed against Boston and Chicago was ancient history. Dallas won three of the next four games to clinch the title, fittingly, on the Heat’s home floor. James didn’t just lose the Finals. He vanished into thin air without explanation. It’s one thing if he played his regular, aggressive game but simply missed shots. Instead, he became passive at the end of games. He treated the ball like a hot potato and passed it off in key moments. “The King” averaged almost 27 points per game in the regular season, but under 18 in the Finals, which is the largest such point drop-off in NBA history. He also scored a mere total of 18 fourth-quarter points in the series. Compare that with 62 for Nowitzki. So maybe Pippen was a bit premature in dubbing James the greatest player ever, and maybe LeBron once again fell short in his latest chance to grab that championship winners' ring. In the final analysis, he ran away from his own coronation. The story of the Mavs winning in such dramatic style led by the brilliance of Nowitzki was certainly compelling but the melodrama of James' quest to be crowned remains the saga that rightly captivates most fans of the NBA. Still to have switched teams and make it all way to the finals in the first year with a different team still says a whole lot about him. Aren't you just perpetuating the discussion over James being a bust as the big story of the Finals? Might have been better to buck the trend and pay tribute to Nowitski and the Mavs' perseverance. Ooh, he's on a quest. Actually, you're only half right; the story does captivate everyone, but not "rightly". He's a product of the media; "above average" has been conflated into "greatest basketball player ever." It's ridiculous. The media treats LeBron as if he was famous for being famous (but can also play basketball). I'll just put it like this: if LeBron James (i.e. mediocrity) can get everyone excited, then it makes sense people have to be muted when mentioning Dirk because he would otherwise shatter their minds. Of course I exaggerate to make a point. There isn't anything "rightly" about the hero worship he receives. It's the same pomp and circumstance that follows the Kardashians, or even Ozzy back in the day before we all realized he never really was Metal. The 3 in South Beach may as well be the Girls Next Door. Same fascination; same talent. i'm a big heat fan.... respect to dallas.... the heat blew the series... they should have been up 2-0 but when dallas took game 2, that was it. lebron needs to work on his game and less on his marketing. he needs more offensive 'go to' weapons like wade has. and all this talk about how great he is? He also needs to accept responsibility and be humble.... we dont need another dbag who hasnt won a ring running his mouth. put up or shut up.... thats the old saying. We need to stop calling him "king"
8 former White Sox players are screaming in their graves at being accused of throwing championship games. the media underestimated nowitsky and the maveriks. for the media, the heat was the favorite team to win. it looks like the media was impressed by the "show of force" put up by the heat's three star players high jumps, long shots and exagerated dunks, not mentioning the array of mimics and grimaces that came after such displays. it seemed to us that bosh, wade and james had two main objectives: impress the crowd and intimidate the maverics into losing their will to fight back. their stfrategy failed and they ended up tired, frustrated and they actually lost their own will to fight, because they, too, like some of the media, underestimated a great foe. be that as it may for a great lesson in class and sportmanship by the mavs, and a bunch of arrogant answers by james to the same media that still follows him. Lebron doesn't have anything to be ashamed of: He reached the final in his first season in the new team, many players never reached a final in their entire career. Instead of focusing on James, we should rather focus on Dallas who were able to lift their game and played great when it mattered, starting with that 2nd game. I am a Heat fan, but a true lover of the game should be able to give credit when it is due. I hope the Heat go one better next season but until then it's "Well done Dallas". Well played and well deserved! Dallas tasted defeat in 2006. The Heat must learn from them. Maybe Lebron & D Wade needs to be practice humility instead of practicing how to be a better player. They should practice being a humble person first. "Lebron + D Wade = PURE ARROGANCE!!!" There's no question on how D Wade played in the finals. He's one of the best but needs to practice humility. You dont mock someone who is playing sick. Having good manners is a lifetime of practice guys. I think Lebron & D Wade needs to start practicing it now, while they're still young. It was a great playoff. From the first round to the finals. Get off Lebron's back. Be happy for the veterans on the Mavs team. All those years waiting, sweating, and playing hard gave them the patience and fortitude to pull it off. How many players in the playoffs played as many minutes as Lebron? While his production dropped drastically in the finals, he is the reason the Heat were there in the first place. He'll get his ring eventually, when his team finishes off as a team. Most of the hype is just that, hype created for your enjoyment. The media just loves to pull our strings and we love them to do it. It's a bit annoying that the world is still obsessed with LeBron even when he loses. He's a great basketball player, but he's not the only one worth mentioning. Let the guy have some dignity in defeat. Stop talking about james and let´s talk about Dirk. Dirk is far the best player with the most humble personality. We need no king, we want players like the rest of us. LeBron seems to disappear during the playoffs, over the last few years he has been great in the regular season but has not been able to transfer that over to the post season. It seemed that Dallas were playing like an inspired team, the media underestimated Dirk Nowitsky, Jason Terry and the rest of the Mavericks. I think that this idea of Lebron not winning has made the media much less interested in how the Mavericks played a great series, fought hard and deserved to win a championship. dirk is humble with sound familiar to the word "team work". the heat expected to much for winning on the other hand the mavs played the better.